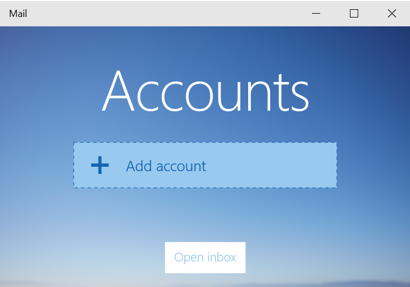 As soon as you set up your account in Mail or Calendar for Windows 10, you can start using the apps. 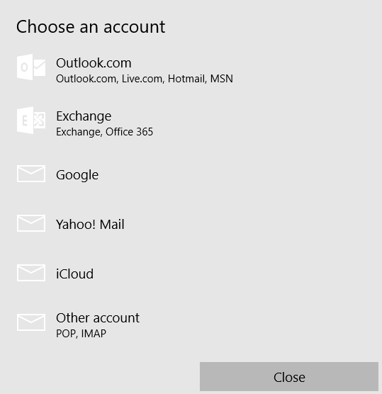 You can set up an Exchange or Office 365 account as well as other accounts such as Outlook.com, Gmail, or iCloud. Note If you signed in to your Windows 10 computer with a Microsoft Account (Outlook.com, Hotmail, MSN, and Live), that account is automatically added to the Mail and Calendar apps and can’t be removed. You can remove any secondary account that you added manually. Open Mail or Calendar and on the Welcome page choose Get started. Note If you don’t see the Welcome page and the app opens, go to Add another email account below to set up your account. Otherwise continue to step 2. On the Accounts page, choose Add account. Choose the type of the account you want to add, and then enter the email address and password for that account. Choose Sign in > Done. Your data will start syncing as soon as your account is set up. If you’re not able to add your account using the steps above, try using the steps in adding your account by using advanced settings. When you open the app for the first time, you might be prompted to decide if you want the app to run in the background. Choose Allow or Don’t allow. You can change this setting at any time in Settings. You can add additional accounts so that you can work with other email accounts all in one place. Open the Mail app, and at the bottom of the left navigation pane, choose Settings Settings icon. Note On a phone or tablet, choose the three dots at the bottom of the page to access Settings. Choose Sign in > Done when your account is set up.